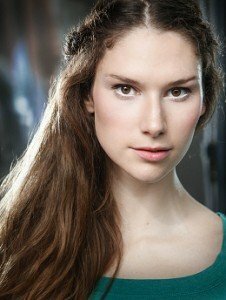 Roanna Cochrane has worked in theatre, film, television, commercials and modeling. Roanna recently took time out from her busy schedule to answer some questions about herself and her career. As a child, how did you first become interested in the performing arts? My first theatrical experience was in the Nativity. My Angel Gabriel was pretty feisty for a four-year-old. All I had to do was hold my arms out wide and say “Hail”, and I managed to knock Joseph and the microphone over in one fell swoop. For some reason that didn’t put me off. In fact, I had a very inspirational drama teacher at school who really challenged me and eventually I wanted to join my local drama group so at age twelve I was so keen, I phoned up and booked myself in! You trained at the Central School of Speech and Drama. What is your favourite memory from your time there? I really enjoyed our production of Into the Woods. I played Rapunzel and so spent the whole show screaming and going mad in top B flats. That was fun. I made some real friends for life on that course, as it’s such an intense period of time training at drama school. You have performed in several Shakespeare productions, including The Tempest, A Midsummer Night’s Dream and Twelfth Night. Which one is your favourite and why? That’s a tough one. The Tempest was my first job out of drama school playing Ariel dressed head to toe in bandages so that’s pretty memorable but my favourite is probably A Midsummer Night’s Dream. It was a beautiful open-air production and I think Helena is up there with the best roles I’ve played. She goes on such a journey from the ugly duckling to the swan, and director Russ Tunney really allowed us to play the comedy as well as the tragedy in the piece. I met my boyfriend, Simon Lee Phillips, on that production. He played Demetrius, so I think I’ll always hold my summer with the Guildford Shakespeare Company pretty dear. As well as other programmes, you have appeared in Vikings on the History Channel, which has just been released on LOVEFILM, and also Mr. Selfridge on ITV. What did you enjoy most about those two shows in particular and also working on television? Television is such a different medium to theatre; you don’t get to edit your own performance so there’s definitely an element of “How is my character going to come across?” I really loved working on Vikings. The script is just so well written, with impeccable historical accuracy regarding culture, religion, etc and this in turn gives the series a lot of integrity. Mr. Selfridge was quite different as, for one, I was a Society Lady, whereas in Vikings I was the Slave Girl. So one character wore an exquisite gown laden with jewels and the other a muddy, raw dress of animal hair. Plus no makeup in Vikings – how terrifying is that? As well as stage and television you have also appeared in several films. Which are your two favourites and why? I really enjoyed independent film The Heart of Dicken Partridge. It’s a beautiful mythological story about a feral Goddess who falls in love with a mortal who is then taken away from her for 7 years. Can love transcend time? It was a chance to go from wild woodland Goddess to ice cold Queen of the Underworld, which was a great challenge. Another favourite is a recently shot film called Not Very Nice People. It’s a dark comedy with a masochistic twist, a revenge film. Let’s just say, boys, don’t cheat on your girlfriend! What draws me to a role is a great script and a character that goes on a journey. What are you currently working on and what are your plans for the rest of 2013 and 2014? I have just come back from Toronto where I have landed a Canadian agent so my plan is to spend part of the year in London and part in Toronto. I have a couple of films in post-production at the moment. You have appeared in various television commercials. Which one has been the most fun? I had a blast on the Go Compare Finishing School Commercial. That was a pretty iconic advert for a while and I don’t think that tune will ever be out of any of our heads. And as annoying as Gio Compario the character is, Wynne Evans himself is just lovely. You are a very talented singer, but your career seems to have moved away from musical theatre. Is there a specific reason for this? I have found singing is a really useful skill alongside acting rather than making it the focus of my work. In repertory theatre I was grateful for my singing training as I found myself being cross cast in shows where they needed versatility. One day we would perform Greek Theatre, the next day a Musical and then Panto for the Christmas season. But you never know when skills are going to come in useful. I found myself playing a jazz singing Troll Princess (Greenclad) in Peer Gynt. Who knew Ibsen would have been up for that?! Even in Vikings I sing an old Norse song, albeit in an out of tune drunken stupor. These days I have been veering more towards TV, film and straight theatre but I’d love to use my singing again at some point if the right project came along. Do you have a particular role you would really like to play, or a show that you would love to be in? I quite fancy going mad as Ophelia in Hamlet or be a prowling Maggie in Cat on a Hot Tin Roof, maybe Honey in Who’s Afraid of Virginia Woolf and I’d love to revise Eliza Doolittle in Pygmalion, a part I played when I was training. Oh, the list could go on! Away from the stage and the performing arts you are also a model. What type of modelling do you enjoy the most? Modelling is an extension of my acting. I always make sure that I try to be a character with a story even if I’m just modeling a coat hanger! I find myself doing commercial fashion, lifestyle and adverts a lot, as high fashion is probably most suited to six-foot fifteen-year-olds and I am neither of those. My modelling has helped my awareness of working on camera for TV and film but, for the most part, modelling is just my day job instead of working in a call centre. I can think of worse day jobs. What are your main ambitions in your acting career? Variety, I guess, and I hope to be challenged in the projects I do. I enjoy the combination of working in different mediums – theatre, TV and film and I hope to be able to continue to do all three and always be learning. I don’t think that ever stops. You always seem to be busy, what is the key (for you) to being constantly employed as a young actress? Well, that’s nice of you to say but I’m not sure it always feels like that. I guess it’s a lot of hard work and a little bit of luck. I could just sit in a café or a pub with a friend and talk for hours. I go to the gym or yoga as it helps clear my mind or I’ll get engrossed in the next TV series, oh, and I like holidays but then, who doesn’t? Although in all honesty, I probably spend the majority of my free time watching theatre or seeing my industry friends socially so I guess I never really escape from it. But would I want to? No, not really.